You may think you have the most pristine house on your street which means you should get top dollar for your house listing but that’s not always the case. A few weeks back I blogged about a couple who were trying to sell their house but with other properties for sale on their street. During the summer the housing market is ‘hot‘ and booming which means there is tonnes of competition out there. If you are selling your house for top dollar you better have some ‘wow factor’ when buyers come to look at your house listing. Putting your house on the property market is a big deal for any homeowner because with that can come many frustrations especially when problems arise and they do. Not only are you the home seller responsible for creating a home buyers dream house listing your real estate agent if you hired one has a job to list the property and network for top attention on the market. This means your real estate agent will host open houses and tell you what price point your house listing would sell best at. They do know what they are talking about BUT not all real estate agents are created equal. It is a career based on sales and for many if they don’t get those sales or if they have too much going on they might not give you the time and experience you expect from them. An agent who has many listing may not be able to host open houses for you or answer your emails and calls right away. This can be very frustrating for the home seller. A good agent will have all their bases covered so the seller has nothing to worry about. This wasn’t the case for these home sellers who have given up on selling their house at the moment. Their house listing has since come down and they are no longer interested in selling their house with their real estate agent. We just so happened to meet up with them this past week and we asked them what went wrong. Boy did we get an earful! When it comes time to sell our house we will sell it ourselves even though we have a great agent who understands. This is because we believe in the for sale by owner and the system. It may not be for you but according to our friends this will also be their next step. They want to be responsible for selling their house because they know it best and have their best interests as a top priority. When selling a house you talk to your agent and if they are good and are committed and care about the sale of your home will give you all the facts. A real estate agent needs to be compassionate and understand what the seller is telling them and what their desires are. Although they bring their expertise to the table being pushy is not a great start which is what their first frustration was. The agent was getting upset with them because they wouldn’t do what he wanted them to do. Our friends found out part of their house listing property size was incorrect which put off buyers. This was an agent error which was modified after it was brought to their attention. Feedback from potential buyers at recent open house set the buyers off and upset the sellers. The potential buyers didn’t hold back and told them that they needed to fix quite a bit in the house and that the renovations to the home were messy at best. The hardwood cuts on the flooring were off and the kitchen was a disaster. One buyer said he’d have to rip it all out and start over again. He wasn’t willing to pay one of the highest price tags on the street for a house he’d have to renovate. The kitchen was newly remodeled and the seller stands by the quality. One couple low-balled them by $20,000 because they wanted the house and were willing to do better updates but didn’t want to pay the price they were asking. Remember there are other houses for sale on the street and pickings this time of year are nothing short of phenomenal. Home buyers can be backed into a corner if there is a NEED to sell. Luckily this couple doesn’t need to sell because they are looking for their final retirement home. Their real estate agent advised them to lower the price on their house based on all the negative feedback and they wouldn’t hear of it. They have no intentions of fixing any more of the house apart from some obvious issues that were missed. They will wait until winter to sell in hopes of getting the price tag they want for their house listing. Although it’s not easy being a real estate agent dealing with sellers, it’s not easy dealing with agents either. The agent for this couple was never present for open houses nor took the time to get to know the couple like they thought he would. He was always too busy to answer their calls and it took days to set something up. The homeowner expected much more especially since 5% of the sale was going to the agents. That’s big bucks! It seemed to them like he was only out for money so they have pretty much fired him but are bound by a contract until winter which is fine with them. According to the sellers they’ve put lots of money into the house over the years and the right buyer will come around. They will consider some of the feedback but nothing over the top. A house listing will fail for many reasons but mostly price is the big deal. If you overpriced your house any buyers that walk through it WILL know and will do their best to catch a deal from you. If not, they walk away. Many buyers can’t be bothered so they just walk away. If your house looks good on camera but a disaster when buyers come to your open house be prepared for negative feedback. No one wants to pay top dollar for your crap renovations, cheap renovations or lack of maintenance to your property. Even if you think your property is pristine make sure you understand what that means. It means your house should almost look brand new or fit the price tag you are asking. If a buyer has to step over mounds of dog hair, your house smells and there are holes in the wall next to your recently updated bathroom you’ll hear about it. Smoking inside your house and pet smells are only two of the reasons you will have buyers come back with a low price. Most smokers think the smell is gone but oh no it’s not. Do yourself a favour and smoke outside and not in the garage it will go right into the house and the garage is part of the house sale. If you don’t care about potentially losing thousands of dollars puff away, it’s your house after all. As ex-smokers we never once smoked in our house for this reason. I will blog more about this in an upcoming post. You will also hear about if your house is dirty or not maintained. No one wants to see dirty walls, mold or water leaks when they are ready to commit to the biggest expense of their life. The worst is looking at a house listing where the homeowner installed the cheapest updates, hired “handy man” specials to renovate and it’s SO obvious the mistakes that have been made. If you don’t have a keen eye and experience for DIY make sure you hire top trades people to do your renovations. You will pay for it in the end with a potential lower price sale if you don’t. No one wants to renovate a new house they just bought that was supposed to be updated already. Although any real estate agent will tell you there are many factors that influence the price on your house listing there are a few main inspirations. The housing market determines price as does your MPAC assessment (Municipal Property Assessment Corporation) and recent sold property prices in your area. Real estate sales in your area must be comparable though. Just because a house that is bigger than yours with a bigger property sold for $700,000 on your street doesn’t mean yours will be comparable. Not all houses are created equal in subdivisions but they do influence each other especially if the area is sought-after and homeowners keep their properties maintained. You can also be assured that what you’ve done to your property inside and out will affect the price tag your realtor will tell you to list your house at. If you plan to sell via a for sale by owner and complete all the paperwork and open houses you need to look at the same things a realtor would look at. Just remember those real estate fees and to price your house accordingly. An overpriced house most likely will never sell unless it’s in a hot area and there are lots of buyers willing to pay. Are you really willing to take that chance? This is a blog post on its own which I fully intend to write soon but there are critical things you MUST do as a home seller BEFORE your house listing goes live. If you don’t get your property ready for an open house or for the day your house listing and for sale sign goes up you risk losing out on money that you could easily profit from. Make sure your real estate agent knows everything they need to know about your property and that your property information is correct. Make a list prior to meeting with your agent so you’re armed and ready to go. Ask your agent questions if you don’t understand or think you may have overlooked something that would be a big deal to a buyer. The second a potential home buyer notices a house listing is incorrect they might just turn around. They don’t want to risk any “hidden” concerns with the sale of your property. If you notice that your real estate agent made an error or tried to pretty up your property to get a higher price (it happens) then tell them to fix it. There’s no point trying to beat the system because someone will always find out and you may have consequences to pay. How many times have you seen photos of a house that have been distorted or stretched to make the property appear bigger than it is just to get the buyers attention. It may look like a garage and a half or double garage but if you read the house listing it’s a single garage. Not what the picture shows though. When we were looking to buy a house if we saw that we immediately skipped over it. If your agent can’t take proper photos to depict what your home looks like then what else are they skimping on? A great agent we met up with will go door to door, hand out flyers and talk to neighbours. You pay your agent big bucks and expect this kind of service. That’s top-notch in our books. Keep your property looking pristine before the open house sign goes up and get rid of any personal items and clutter in the house. Clean the house and remove any pets for the afternoon by taking them to another family members house. If you smoke you have no chance of getting rid of the smell so be prepared for that negative feedback and potential loss of money. Overall, if you aren’t prepared for negative feedback don’t sell your house. The reality is that every potential home buyer WILL find something they don’t like about your house. If by chance you get passed by time and time again by home buyers who visit your house keep in mind their opinion is the same as customer feedback. You need to take a hard look at your house listing and ask yourself if you can make changes to your house that would first impact the sale of the house and motivate buyers to buy. Your MLS listing (Multiple listing service) is your store front so make sure that photo is top-notch but even better make sure your property is as flawless as can be. I wish this couple all the best in the future selling their house. Have you ever been frustrated by your house listing and took it off the market? Why? I didn’t get much done this week with bathroom renovations because it seemed like one thing after another kept popping up to do besides that. Our son had his one year photographs done on Thursday which was a blast for all of us. The cake smash was the best. I don’t think I’ve ever seen a child mash a cake the way our son did. He did more mashing then he did eating it but it worked out in the end. We can’t wait for the photos. They cost us $140 and we pay for printing if we want. It was much pricier than we normally pay but for his one year birthday we decided to hire a professional photographer. Other than that we made it out to the pool once this week and a couple of trips up to the park. One of those trips was a lovely afternoon picnic. I have a couple of weeks holiday coming up soon so I have to bust a move next week to get this job done in the bathroom. I kind of wish I renovated before the baby arrived but you don’t really know what you are getting into until after the fact I guess. Live and learn. Just in case you’ve missed any of my blog posts this week I will share them all below. If you have a question that you would like to ask Mr.CBB fill out the Contact Mr.CBB form on the Home Page and send in your questions. If you want to share a story via a Fan Question only please ensure that there is minimum 500-1000 words and details… we love details! Right now CBB is posting Tuesday (Grocery Game Challenge) , Thursday (Personal Finance Post), Saturday (Personal Finance and Weekly Wrap-Up and a recipe on Sunday! If you have a brag that you want me to share email me at canadianbudgetbinder@yahoo. (ca) < remove brackets) or fill out my contact form by Friday each week to have your brag considered for the Saturday post. 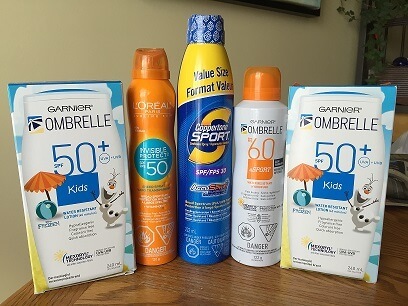 This week CBB FAN Jen Peacock shows us how to maximize a sale, coupons and coupon apps to get the BEST prices on sunscreen products. The Ombrelle Kids scanned incorrectly and I received $9.99 SCOP (Scanning Code of Practice). This is my way of giving back to the personal finance community through networking and sharing knowledge with my fans. Today I’d like to welcome my blogger friends from Fruclassity! Last year, I wrote a post at my site Prudence Debtfree about Mr. Money Mustache’s subculture of extreme frugality. “Badassity”: was it for me? As it turned out, no. At least, not always. Although I am intentional about “developing my frugality muscle”, there are times when I choose to spend on a particular “want” that is of value to me. Laurie, from The Frugal Farmer, left a comment after that post. And so were planted the seeds of Fruclassity: frugality for the not-so-badass. The Frugal Farmer and Prudence Debtfree joined forces, and in the spring of 2015, our new site came into being. At Fruclassity, we encourage you to take that first step – and then the next – and then the next . . . towards greater frugality and better financial health. But we also affirm you in starting from where you are. Come and check out our site to find encouragement as you make your way towards your financial goals! I created this second Facebook page because I love food so much and I wanted to showcase only food 24/7 and this is where I do it. I also share recipes on CBB once a week on Sundays either made by me or my in-house home blog cook Nicola Don! 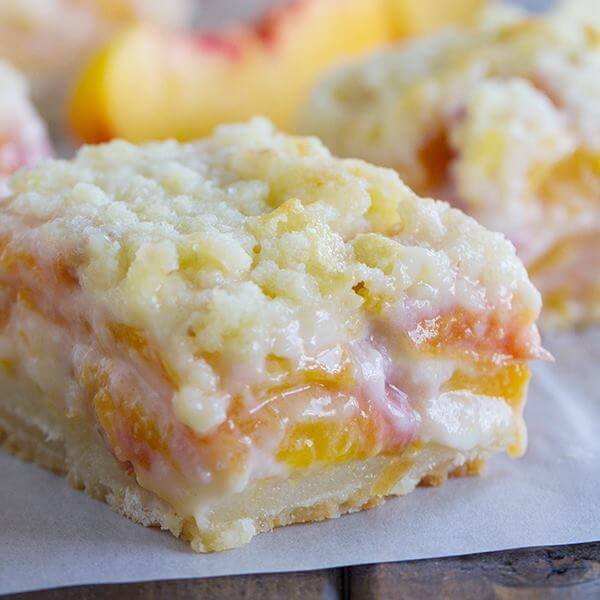 This week our Top Recipe Pick goes to Deborah at Taste and Tell Blog for these amazing looking Peaches and Cream Bar recipe which has been widely shared all over the web. I can’t wait to make them! Editor’s pick (That’s me Mr.CBB) this week goes to my friend over at Freedom 35 who shares this brilliant post about How much money you need to retire! Plus.. there is a handy retirement calculator you can play around with to see how much you will need to retire. Name the first thing you buy at the grocery store– A great what’s for dinner question! Thanks… oh probably fruits and veg! Do you pay back OSAP (Ontario Student Loans)?– Um, you bet you do! If an item is scanned am I entitled to buy it– Not at all, just say please remove from the order as I no longer wish to purchase this item please. My wife married me for my money– Sorry it took you this long to figure it out! Don’t forget to subscribe to my daily blog post by entering your email address on the home page and verifying the subscription email once it is sent to you. Though I am not selling my house, the one I know an effective strategy is to improve the curb appeal. Nothing is more important than a first impression. Right? It’s amazing though how many people don’t clean up their property UNLESS what they consider pristine and what I consider pristine are two different things. We bought this house 23 yrs ago, and if we were to sell, would likely use the same agent as before. He was good, talked us through the pricing and such and was very nice. But. That being said I would be looking to move out completely before putting the house on the market. This is the 4th house we have had over 39 yrs of marriage. We have been jerked around by different agents over the years and I refuse to put up with that crap again. Everything from no shows to 5 minutes warning to showing up over an hour late to low balling us as we had a conditional offer in on a new build that was about to expire…. Stuff that. I can’t see hubby being able to handle selling ourselves. I’ll just move out, clean it up and walk away from all the hassles of having open houses and showings. Been there and no interest is going there again. Nice deals Jen got!! I must have a good look over that recipe…it looks so good!!! sounds like they hired a bad realtor. We used one to sell our house because it was our first time selling and we needed advise. It took several interviews before we found the right realtor. That is exactly what we think as well and why they want to sell private the next time they put the house on the market.